Root filled teeth become progressively more recognized as a threat to health. When your primary care physician tells you “it’s all in your head”, it very well might be. 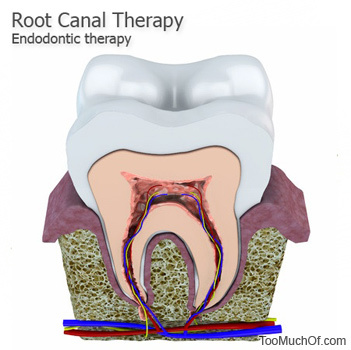 When a tooth is endodontically treated, the nerve is removed and the pulp chamber of the tooth is sealed off. The bacteria entrenched inside the structure of tooth becomes uncontrolled and creates the potential for causing a high percentage of chronic degenerative diseases. All teeth that have had root canal procedures remain infected, regardless how many times it has been done. This is mostly due to the microscopic canals within the tooth that cannot be reached by antibiotics and instruments. To adapt to the lack of oxygen, the bacteria transforms via a pleomorphic change to an anaerobic subtype. It becomes smaller and acquires ability to proliferate and multiply at higher rates. This type of bacteria produces sulfur containing compounds such as thioethers, which are considered one of the strongest poisons known, besides radioactivity. Even if a sealed root canal tooth does not cause any significant discomfort and/or fistulas, and is completely “silent”, it may still continue to harbor the pathogenic bacteria that releases extremely dangerous toxins into the blood stream. A root filled tooth has no fluid circulating through it and the tubules structure becomes a transport pathway for an anaerobic bacteria, which consequently stays unaffected by antibiotics. The bacteria can move out into the surrounding tissues and further transported to other locations in the body via the bloodstream. It can then affect any organ, gland or tissue, colonizing and producing recurrent and chronic low grade infections. The degenerative diseases as a result may include unrecognized autoimmune conditions, arthritis, rheumatism, heart and circulatory diseases and nervous system dysfunctions. The problem arises from the fact that it is practically impossible to extract the dead nerves completely and eliminate the residual bacteria within the tooth structure with the current antibacterial agents. Since there is a risk of toxicity from these compounds long term, the drug choices are limited. Gutta percha filling – statistically not very effective in reducing the bacteria growth, thus over 55% failure of treated teeth. It may also be contaminated with barium. Biocalex (formerly known as endocal) – causes breakage of teeth in many treatments. Calcium hydoroxide – highly toxic if used permanently inside the tooth. If the root canal procedure is still desired, the best option would be to leave the calcium hydroxide inside the chamber short term (up to 1 month) to eradicate bacteria, then remove it and seal off the root canal. In summary, if remaining in good health is the objective, and especially in those who already have pre-existing conditions, a root canal procedure may only lead to further complications. A chronically infected tooth as a result of root canal procedure may produce low grade inflammation that might not be easy to detect. Years can go by, without pain, or any visible issues, even on x-rays. However, the infection would proliferate through the tissues and continue infecting the blood stream. Since the bacteria enclosed within the sealed tooth transforms to survive without oxygen, an immune system becomes chronically activated, resulting in symptoms that might seem completely unrelated to oral health. The resulting illness may resemble a chronic viral illness or a systemic inflammation condition. If an individual has had a root canal procedure done and experiences a systemic illness without a reasonable explanation, a more careful examination of the tooth is warranted. Partial clip-in dentures (removable bridges) - This is the old-school method that has been proven to work although it may produce an unnatural appearance and contribute to a compromised hygiene. Bridge – requires filing down healthy teeth next to the extracted tooth and may cost several thousand dollars. Leaving tooth missing – undesirable as it will contribute to problems with gums, development of TMJ, sacro-cranial problems, decreased chewing ability which is critical for proper digestion. Gaps formed by missing teeth can be implicated in periodontal disease, infections and may affect a person’s ability to eat or speak normally. Titanium implants [srs] (require 6 months healing time after installation) – at this time there is no long term data how they affect health. The implant’s rejection rate is about 25%. The rejection comes from peri-implantitis, an inflammatory condition of the bone around an implant which results in bone loss and eventual loss of the implant. An oral galvanism is a condition that occurs when two dissimilar metals are used. This drives the ions of metals into the gum tissues and generate electricity that affects the body and especially brain rhythms, creating an overstimulation. This is also true for silver fillings, metal crowns or any other metals present in the mouth. Chronic insomnia and metal taste in mouth are generally the initial symptoms. Oral health maintenance is the best method to prevent tooth cavities and root canals.